The RichWater system is based on a new groundbreaking system combining low-cost and energy efficient MBR treatment, a module for mixing the optimal fertigation water connected to the up-to-date irrigation technology and an advanced monitoring /control module including soil sensors to guarantee demand-driven and pathogen-free fertigation. Implementing the system in the agricultural production process results in a more eco-friendly use of water resources, cost savings for freshwater and fertilizer and the possibility for commercial food producer to adjust the fertigation unit for individual needs using a mixture of fresh and treated water. 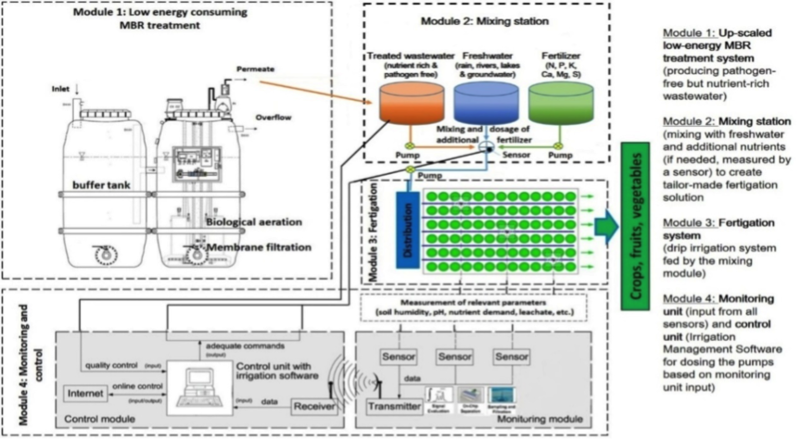 A low energy MBR has been designed for the wastewater treatment module in a way that the contained nutrients (mainly nitrogen and phosphorus) remain after the treatment whilst pathogens are removed. The mixing station mixes the appropriate proportion of freshwater and the treated wastewater coming from the MBR, which is then fed into the fertigation module (drip irrigation). The appropriate mixing level is determined by monitoring the level of nutrient content in the soil via sensors; this information is sent by remote control to the monitoring unit, which converts the signals to be read by the control unit. The control unit automatically adjusts the mixture inside the mixing module via valves according to the crop’s demand. The upscale of TREAT&USE prototype will permit to overcome main barriers identified to reach the market: to reduce energy consumption, to increase automation, to improve and simplify end-user interface, etc. and adapt the technology to intensive agriculture production. The result will be a commercial system thoroughly demonstrated and tested in its operational environment. The successful FP7 Treat&Use project is the base for the RichWater approach. The system has then been successfully applied in the test field in Southern Spain where various positive impacts (e.g. no additional fertilizer nor freshwater) could commonly be observed. Results of crop production and yield are equivalent using treated waste water and clear water. Use of alternative water source for irrigation permits to safe valuable water resources (e.g. aquifers). Low values of pathogens in water and fruit proof that TREAT&USE is a safe technology for waste water reuse in agriculture. The prototype can be up-scaled to higher production rates, including food industry uses. It’s technically possible to use waste water directly from the sewer and provide it with the appropriate quality required by legislation. The use of waste water reduces the needs of additional fertilizer (and for the tomato crops tested in TREAT&USE, there is no need of additional fertilizer at all). Low Operation and Maintenance and high automated control system allow an easy operation of the end user with relatively low annual costs.